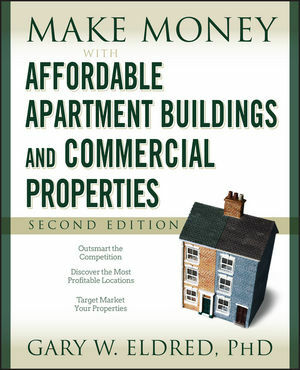 Make Money with Affordable Apartment Buildings and Commercial Properties, Second Edition, shows you how to build wealth with affordable multi-unit residential and commercial buildings. Low-priced income properties can yield higher returns than single-family homes?especially if you manage them yourself. This book shows you how to find, assess, buy, and manage apartment buildings, retail offices, self-storage, and other overlooked investment alternatives. In today?s tough housing market, these properties offer great returns. GARY W. ELDRED, PHD, has invested successfully in real estate for more than twenty-five years and has served on the graduate business school faculty at Stanford University and the University of Virginia. One of America's top-selling real estate authors, Eldred's other books include Investing in Real Estate, Fifth Edition, Trump University Real Estate 101, and Make Money with Flippers, Fixers, and Renovations, Second Edition, all from Wiley.